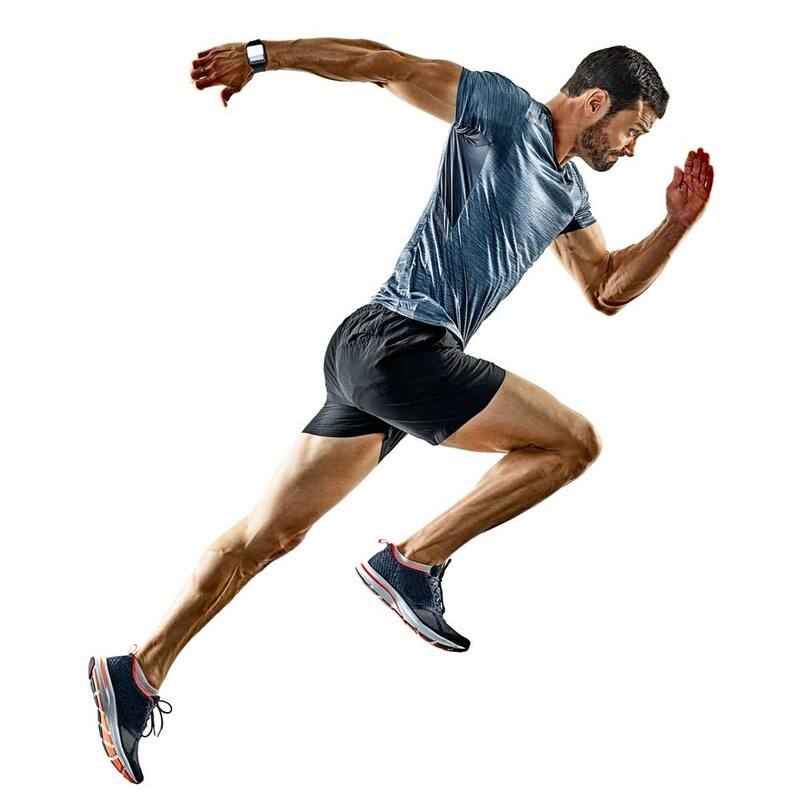 Heal ANY new or old ankle injury. Follow along in 3 easy steps at home. or it could hurt for life! *Evid Based Med 2008; 13 (6):187. Margo KL. **J Med Sci Sports Exerc. 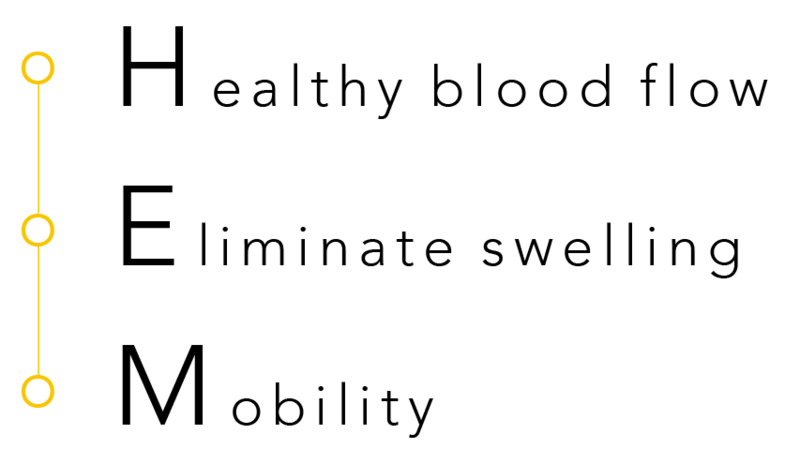 1984; 16(1):64-6. Tropp H.
***New York Times, 2015. 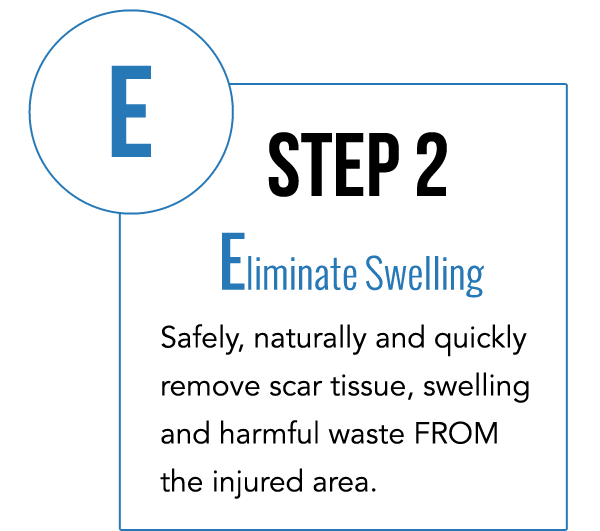 Don’t Just Walk Off a Sprain. 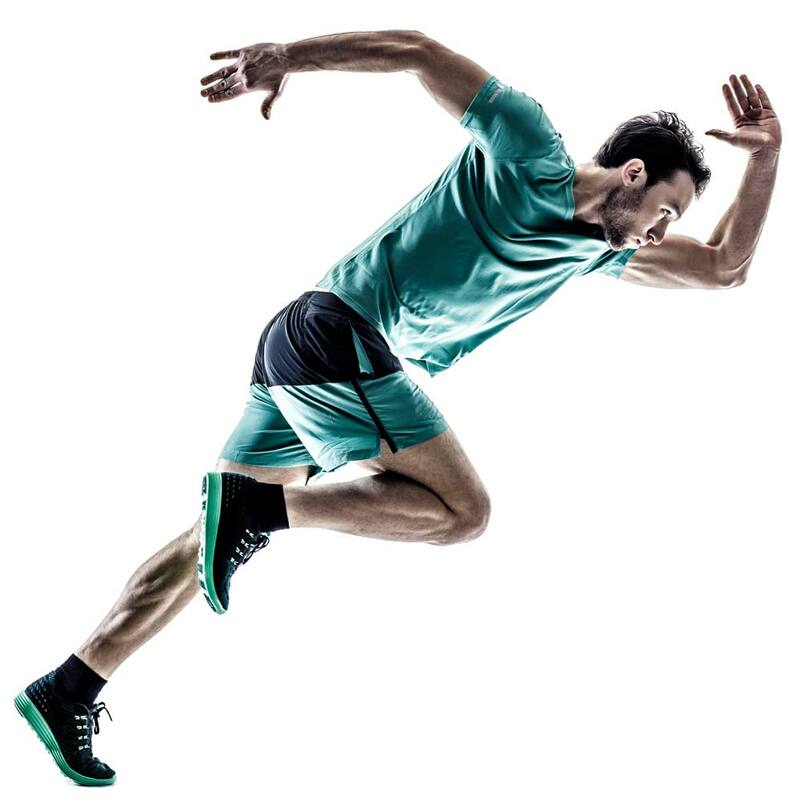 Reynolds G.
Our scientifically backed system has helped people of all ages fully and quickly heal an ankle injury at home. It’s safe, easy to do and extremely effective. 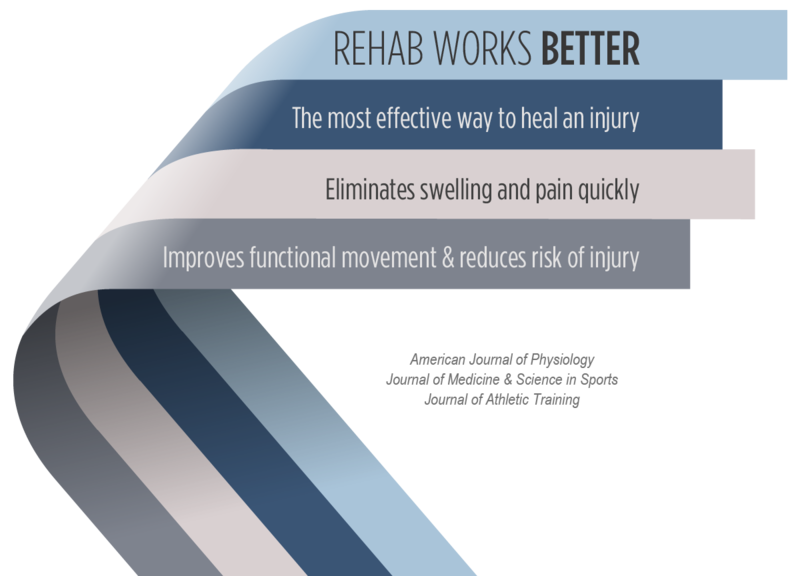 *Combines simplicity with the most current research to naturally improve recovery times from a sprained ankle. *H.E.M. gets my athletes back on the court quickly and significantly strengthens and protects their ankles. *I recommend H.E.M. for all types of athletes... Exceptional enlightening science you can't ignore! 5 stars!! H.E.M. 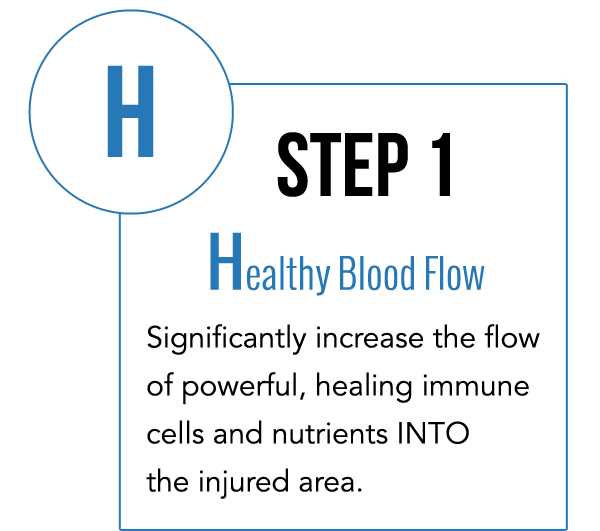 was designed to supercharge the body’s natural healing response to an injury. That means safely and quickly eliminating swelling and fully repairing all the damage in your ankle. Typical results are pain free walking in a few days. H.E.M. significantly improves ankle strength, stability and range of motion. That means healthy, pain free movement AND a much lower risk of sprains without ankle braces, wraps or tape. Just follow along with the easy step by step videos or full color e-book on ANY device (you get both). You don’t need any equipment. Anyone can do it. We designed H.E.M. to work for any new or old ankle, foot, calf or achilles injury, whether it happened today or years ago. And yes, H.E.M. works for all types and grades of ankle sprains. If you’re not satisfied, just send an email for a full refund. No hassles, we promise! for a full refund. No hassles, we promise! *I started the program on Monday and by the end of the second session I could bear weight on the foot. Today is Friday AND my foot looks almost NORMAL! Thank you thank you thank you SO much for this wonderful program! 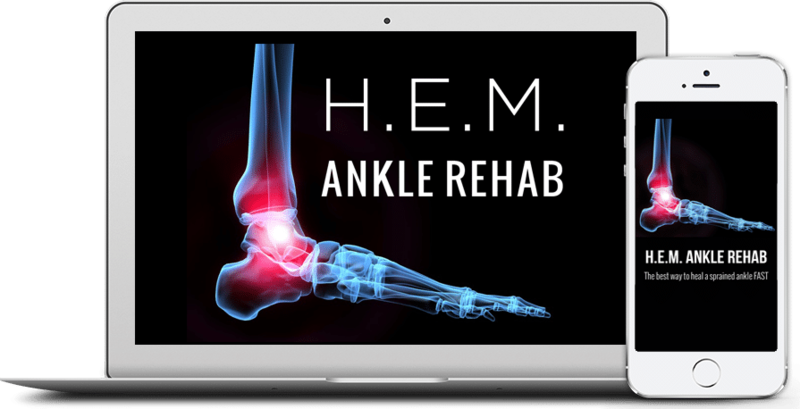 *HEM Ankle Rehab has given me a shot at regaining my active life at age 56. I am sincerely grateful for your clear, detailed, graduated, and EFFECTIVE program. It has had a major impact on the quality of my life and I thank you for the time and expertise it took to create. To say that HEM is worth 10 times what I paid for it is an understatement. *By day two, my range of motion was incredible. It's amazing what this process did. By day three, you could start to see my ankle. By day 6, I had no pain and was feeling good and I could actually do squats and move up and down on one leg without any pain. Thank you H.E.M..! A great program! *This is by far the best money I spent in my life. This turned my life around, because my life is training and now I can train without pain. Thank you, Scott, straight from the heart. *Ok, all I have to say is WOW! 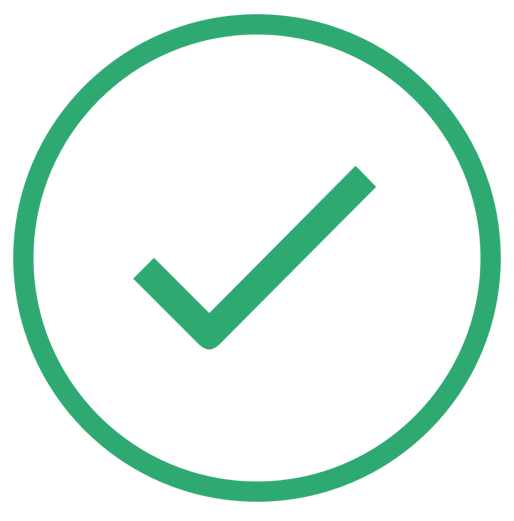 Not only did the info absolutely save me, and I mean really save me, (I take care of my son and he is totally disabled), your customer service is at a light speed pace. Absolutely wonderful, powerful, and helpful information. Truly nice to purchase something that actually works. *I love it! It has been an amazing recovery. 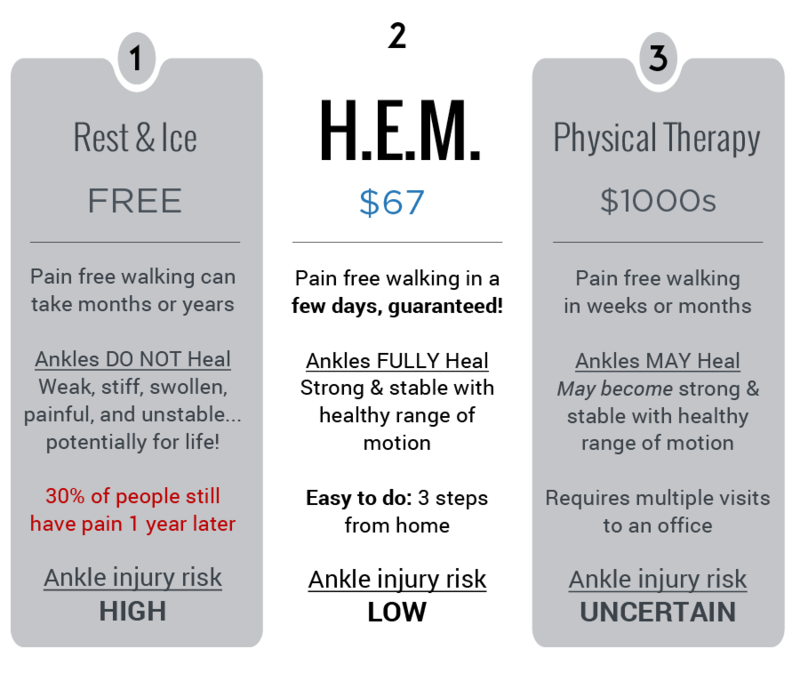 It's a great system and you should check it out if you have any ankle problems. I especially want to thank Scott Malin. I am so impressed! It's worth every cent. *It works! Been three days and I'm at 85%. Hoping to be at 100% in the next couple days and then keep doing step 3 for strengthening to prevent future injury. *Your program is wonderful!!!! I was back hiking in 7 days and was able to go on my backpacking trip through Glacier Natl Park that I had been planning for the past 8 months!!!!! Thank you so much again!!!!! H.E.M. 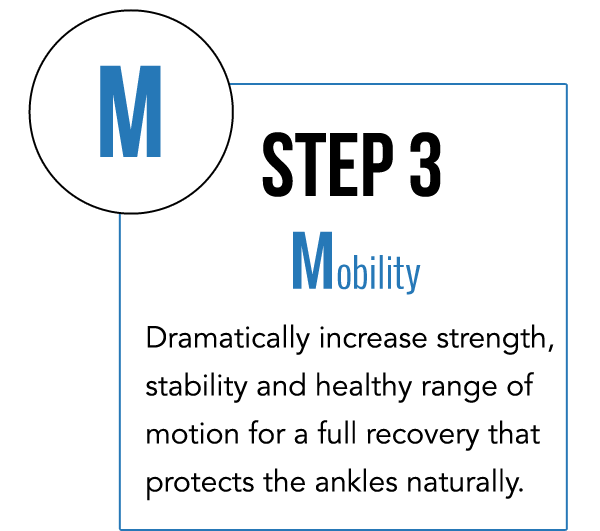 will save a lot of money & time, but most importantly, we guarantee your ankle will be strong & stable with a LOW risk of re-injury. *My daughter is 13 years old and plays ASA competitive travel Softball. She injured her ankle on a play that helped propel her team into a championship game. After a doctor’s visit the next morning and learning that it was severely sprained I knew we had to do something to get her back on the field. After 1 week of H.E.M., my daughter is running, hitting and doing the things she enjoys most. I can’t even begin to thank you for the valuable information that you have provided. I have since shared this information with former USA national athletes. Thanks for the invaluable information, it’s money in the bank!! *Our 11 year old daughter, Celé, was selected as Captain of the national indoor hockey team for Namibia, but she sprained her ankle 2 days before leaving for the Pro Series Indoor (PSI) Nationals in Cape Town. We immediately started with the H.E.M. programme and the results were amazing. Her team took home gold medals as undefeated champions. We are convinced that the H.E.M. 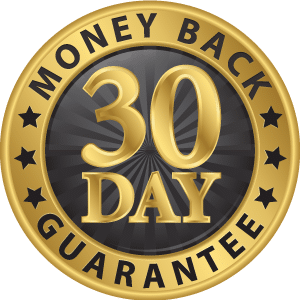 system caused the expedited healing process as we could already see a huge difference within the first 24 hours and we continued to see improvement every day from then!! *My daughter broke her foot and was in a boot for 8 weeks. She started PT rehab two weeks prior to getting her boot off. The day she got her boot off she tried doing a jump shot at basketball and came down, severely spraining her ankle. It was so bad that she could not bear any weight on it and she was back on crutches. Two days later she still could not put any weight on it and it brought her to tears. I did some research and found HEM rehab. I went to bed and apparently my daughter stayed up late doing the rehab. I went to go help her in the morning to put her boot on and when I got to her room, she came walking out on her own, no boot, no crutches, and a HUGE smile on her face!!! Hands down BEST money I've EVER spent!! I tell everyone about HEM now. Thanks for sharing creating this amazing program!!!! Learn the best exercises and workouts to maximize fat loss, improve posture for that stunning physique while also correcting muscle imbalances to reduce chronic pain (including the knees, shoulders, hips, and low back). Do it ALL at home or anywhere you want! NO equipment needed! MEET THE CREATOR OF H.E.M. Scott is a well recognized celebrity trainer, fitness expert and 7-time best selling author. 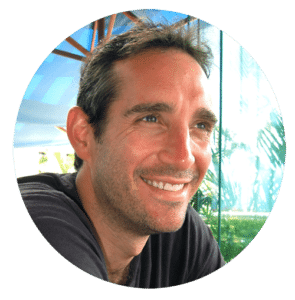 He created a number of extremely popular YouTube Videos on nutrition and fitness that have received over 10 million views. Scott has also been featured on ABC, KTLA News and KDOC TV multiple times as a fitness expert. This website is not a substitute for professional medical advice, diagnosis, or treatment. Always seek the advice of your physician or other qualified health provider with any questions regarding a medical condition. 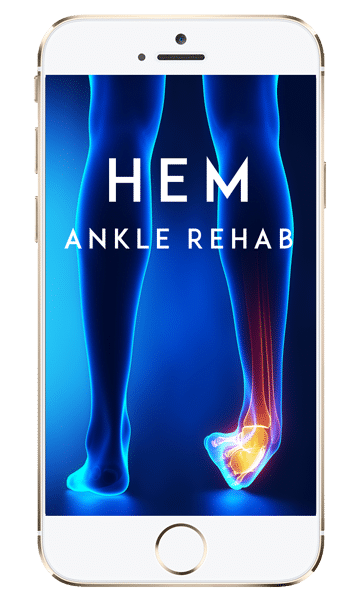 ©HEM Ankle Rehab. All rights reserved.